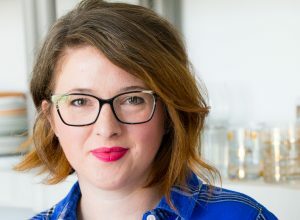 There is something I find thrilling about creating a meal in my kitchen that is basically an open faced sandwich but that I can call a name that is chic and lovely – like ‘tartine’. The word tartine is full of delicate sophistication and brings to mind airy cafes in Paris, complete with lovely company and of course, a delightful coffee. Or is it tea? We’ll go with coffee, because this version of Paris is purely in my head. In reality, I did eat these Summer Squash Tartines in lovely company (my kiddos), but not in the airy cafe in my head. Instead I was in my (thankfully) air conditioned house, complete with coffee in my favorite Crayola crayons mug. What can I say? I’m a former art teacher and I have a soft spot for crayons. Trust me, the mug is awesome. 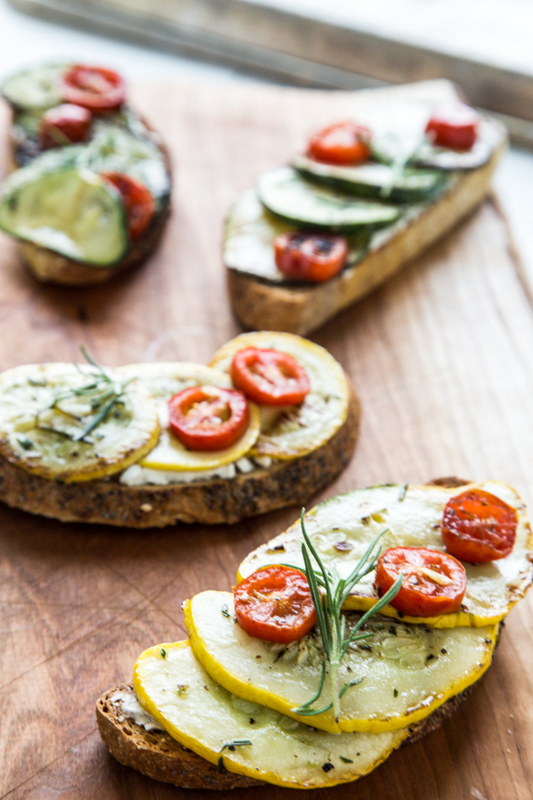 I made these Summer Squash Tartines after receiving a wide, and spectacular variety of summer squash last week from our CSA. 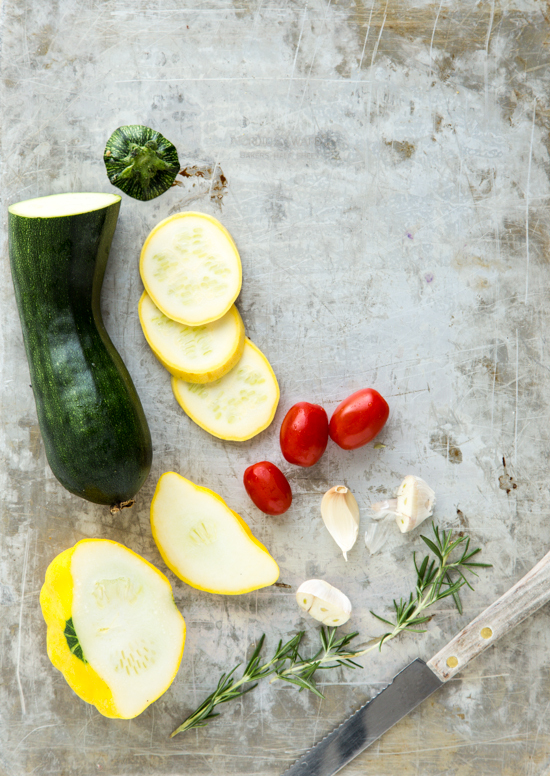 I’ve waxed poetic about our CSA before, but let me just say again – I love it! The summer squash last week was part of the ‘extras’ box from which we can browse and choose the vegetables that we would like to take home, on top of our usual share. 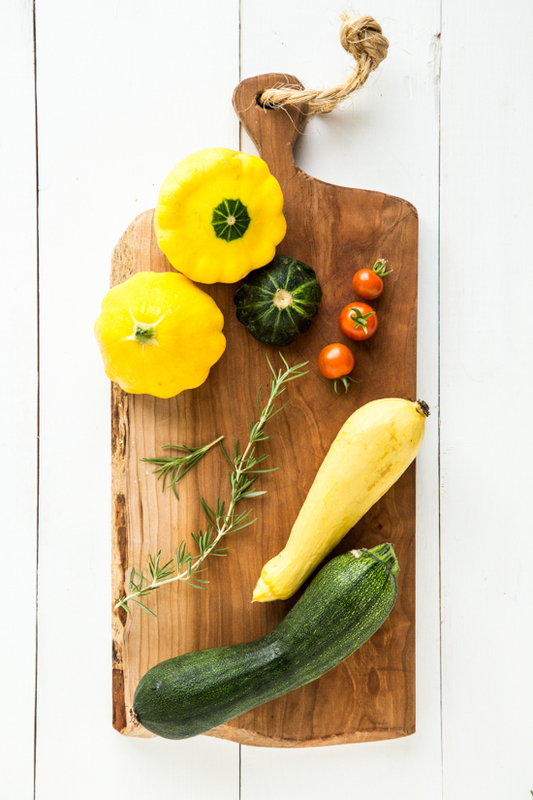 I could not resist these adorable little pattypan squash as well as the more traditional zucchini and yellow squash. I wanted to use the squash in a way that showcased it, and didn’t hide it away in a muffin or bread. Not that I have anything against muffins or bread – in fact, I quite adore muffins and bread. It’s just that I actually really like zucchini and wanted it to be the star of the show. Plus, these were too beautiful to hide. Anyhoo, while you’re waiting, be sure to try these tartines. 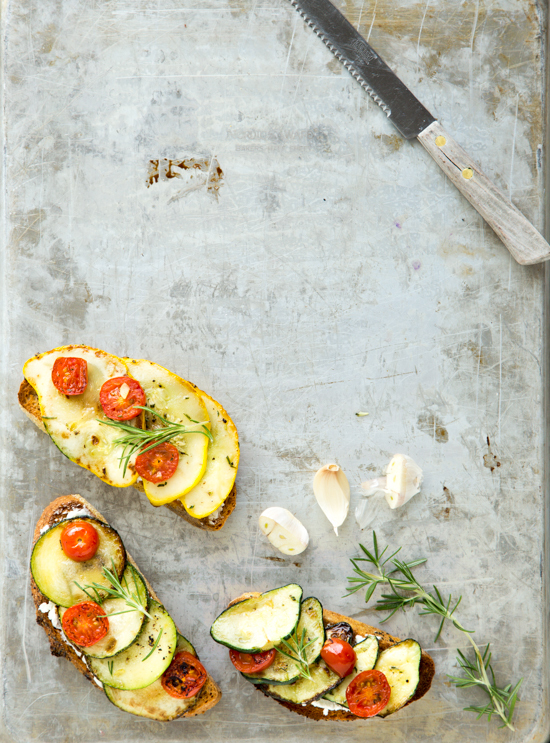 They start with whole wheat, rustic bread (I used my favorite bread) spread with tangy goat cheese and then topped with simple, sauteed summer squash, cherry tomatoes and aromatic rosemary. Delightful, I tell ya. I have made these with and without tomatoes, and both ways are fabulous. 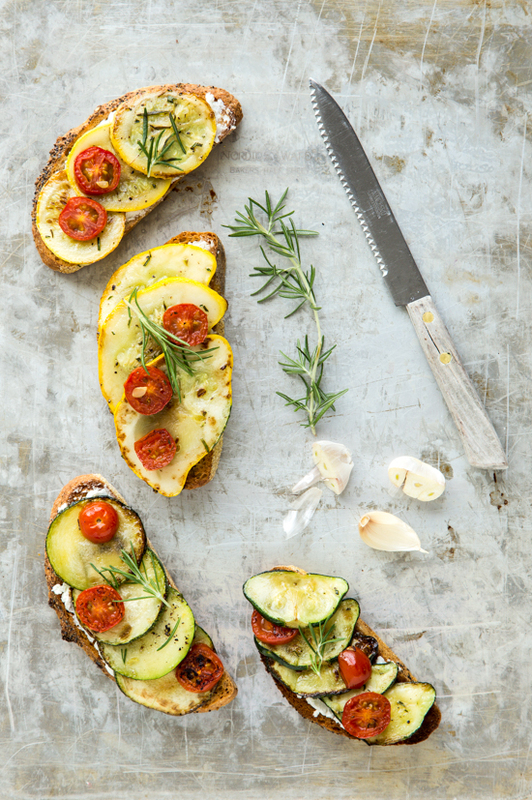 Feel free to add your favorite vegetable or switch up the cheese to create your own version of this tartine. Yumm. This looks awesome. I could eat this three meals a day, no troubz. Thanks so much, Laura!! I had originally made these as a side dish, and was so blown away by them, I have not totally forgot what the main course was that night. They are substantial enough for a main course, that’s for sure 🙂 Enjoy!! Thanks, Kiersten! I’ve always wimped out of growing my own, so I’m so glad that my CSA has had a real bounty of them the last few weeks. I can’t wait to see what you do with yours! Gorgeous! 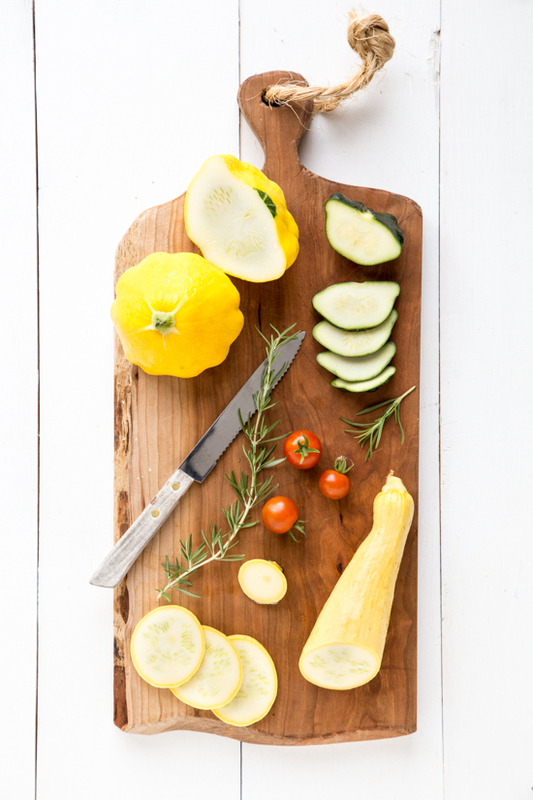 I have a ton of summer squash right now, and have been searching for new recipes to use them in. I can’t wait to try these! wow. These are almost like bruschette if you added balsamic vinegar. hmmmmm I can’t wait to try them!!!!! So unique.